Set in 1958 Chicago, Shaping the Story revolves around Sam Garfield, a Pulitzer Prize winning Chicago newspaper columnist who is forced to take a critical look at himself and his relationships with those closest to him --his mentally ill twin brother, the woman he loves, and the people he writes about. Plagued by bouts of melancholy, Sam’s personal life is at a standstill, haunted by the secrets of his past: As a teenager, Sam’s brother Cliff puts a shotgun to his throat as he sleeps; and when Sam’s hidden illness is revealed, his big league baseball career ends abruptly. Now, in his early 50s, he still tries to keep Cliff’s insanity a secret. It’s only when the woman he loves confronts him about his refusal to accept Cliff’s mental illness—and a trip to his boyhood home where he comes across an emotional diary kept by his twin—that Sam realizes he needs to come to terms with his past if he is to have a future. This middle-aged self-awakening becomes the lens through which Sam approaches his newspaper columns, which appear at the end of each chapter. It’s been only a week but Chicagoans miss her already, still expecting to see her come around the corner, dressed in cream and green, hugging the pavement, cutting through the snowflakes, accommodating us all. On a warm Saturday in June, Green Hornet 7213 completes her final run and rolls quietly into a CTA barn, never to be seen again. The smell of oil—or is it gas?—startles the young mother of six. She sits up in the bed; her eyes dart across the cramped room. She checks on Paula, her baby, and covers her with a towel, but doesn’t notice Roy, Jr. sitting against the wall, his eyes covered with tears. Then, an explosion flashes up the gut of the South Side tenement. Orange flames swallow the flimsy walls and floorboards and engulf the stairwells. Hers is the only voice: “My babies. My babies.” She opens the room’s only window, squeezes Paula against her chest, and pushes herself off the ledge. Former Chicago journalist John Theodore is the author of two non-fiction books. Evil Summer: Babe Leopold, Dickie Loeb, and the Kidnap-Murder of Bobby Franks (Southern Illinois University Press, 2007) received an Illinois Historical Society award. Baseball’s Natural: The Story of Eddie Waitkus (Southern Illinois University Press, 2002) was named “one of the 12 best sports books of 2003″ by Booklist. In Baseball…and Other Romantic Life Lessons (ebook), Theodore weaves fantasy and fact in a reflective and historical collection of essays, columns and short stories. View all works by John Theodore's on Amazon. Pretty swank, this Mandel Hall. Once I find my seat in the front row of the balcony I give the place a good look-over—hand-carved oak, Tiffany windows, stenciled tapestry. A wide smile breaks across my face when I think of the irony. My old pal, Nelson Algren, prose poet of Chicago, friend to whores and junkies, hustlers and winos, bookies and players, sluggers and counter-punchers, is about to address U. of Chicago students and faculty. Images of Frankie Machine, the man with the golden arm, swarm my mind. He’d have something to say about his creator wasting a Saturday night in Victorian-era overkill. Connect with Sam Garfield on Twitter. And read more from Sam at Mid-Century Musing. "With Shaping the Story John Theodore managed to write a tribute to Chicago in 50s, now long gone, while his main protagonist is journalist through which the whole epoch is reflecting – about the time and the profession that then meant something very different than it is today. Sam Garfield is a Pulitzer Prize winner who lives in Chicago and writes column in Mirror newspaper. The year is 1958 and Sam is leading life full of question marks for the time ahead of him – the relationship with one special woman in his life and the care for his twin brother who is mentally ill - forcing Sam to start questioning himself in which direction his life would go. While reading John Theodore’s novel, reader will feel as if transported through a time machine 60 years back in time – the events, people, affairs, Chicago city as a whole, all seems as though we ourselves are part of this story and interesting journalistic life that Sam leads. And considering that so detailed and convincing story of not so recent history is not easy to write, the author cannot be disputed extraordinary effort on collecting data and research, but also a great style that will keep reader interested for his work until the very end. Therefore, I can highly recommend Shaping the Story by John Theodore as a faithful reflection of subject and time it discuss and certainly I plan to read the other works by this author." "Masterfully contextualized and vividly described, Shaping the Story can be considered a model in modern retrospective literature. John Theodore uses his talents well, as he understands and illustrates Chicago history at a level which very few writers have ever achieved. 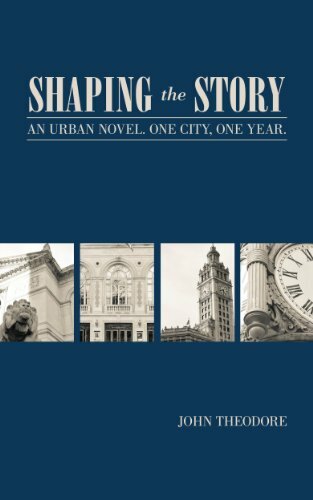 Theodore seamlessly weaves personalities and events of local cultural importance into the story - personalities and events which those familiar with the city hold both dear and despised. Undoubtedly, this is one of the finest novels written on Chicago in recent memory. Anyone seeking a true and colorful snapshot of the city should read this book." - Doug Feldmann, author of "Miracle Collapse: The 1969 Chicago Cubs," "September Streak: The 1935 Chicago Cubs Chase the Pennant," and "Keith Magnuson: The Life and Times of a Beloved Blackhawk"